Setting up a one-page navigation on your website takes no time at all with X or Pro, and you can utilize this powerful feature on any page of your site! This means you can take advantage of this engaging effect for multiple product showcases, marketing squeeze pages, alternate homepages, and more. The first thing that you'll need to do before anything else is actually creating the page that you want to use your one-page navigation on. Make sure to keep this in mind as you link out to the IDs on your page as you will need to update your links depending on whether or not you add any new content. After you have completed your page, the next step of the process is to create the menu that you will use on this page. 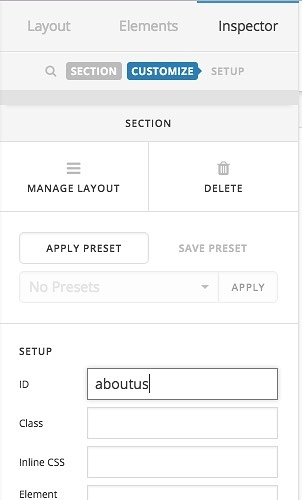 To do so, go to Appearance > Menus in the WordPress admin panel. Once you are on this page, select the create a new menu link near the top of the page. Give your menu a name in the Menu Name field and select Create Menu. Once you have done this, you will be taken back to the main menu creation screen, where you will see a list of link options on the left-hand side of the screen. You will likely see options to link to pages, posts, categories, and more, but the section that we want to focus on for now is the Links option. Select the Links option and you will see two input fields, URL and Link Text. The class that is added and removed from each menu item as your user scrolls through your site is called current-menu-item. This class will be added to your links once a visitor scrolls to its corresponding element on the page. Depending on how you have your page setup, your first link might not have this "active" class applied to it right away. Should you want one of your links to display as "active" when a visitor first loads your page, you can add the current-menu-item class to one of your links. To do so, click on Screen Options in the upper right corner of the Menus page and ensure that CSS Classes is selected underneath Show advanced menu properties. Next, go down to the link in your menu that you want to add your class to and click on it to expand it. Once your link item is expanded, you should see an input field labeled CSS Classes (optional). Simply input the current-menu-item class here and your link will show as "active" when a visitor first loads your page. Finally, you can still add normal links to your one-page navigation if you'd like, as well as dropdowns. This leaves things very flexible and allows you to setup your navigation exactly how you want. This works really great if you're wanting to split test two different homepage designs with different amounts of content on the page, but you want both of them to have a link out to your blog page as well. The last step in your journey to one-page navigation is to assign your menu to a page. To do so, find the page you want by selecting Pages in the WordPress admin area. This will bring up a list of pages that you have created. Locate the page you want and click the title so that you can go through to the edit screen. Below the editor, you will see a meta box labeled Page Settings. Inside that meta box, there is a setting called One Page Navigation with a select dropdown to the right. This dropdown will feature every menu you create. Simply locate the menu that you just created, select it, and then click the Update button on your page to save your changes. Should you choose to turn off the one-page navigation for this page at a later date, simply set the dropdown back to Deactivated and your Primary menu will take its place. Take note that no matter the global navbar settings for your site (i.e. 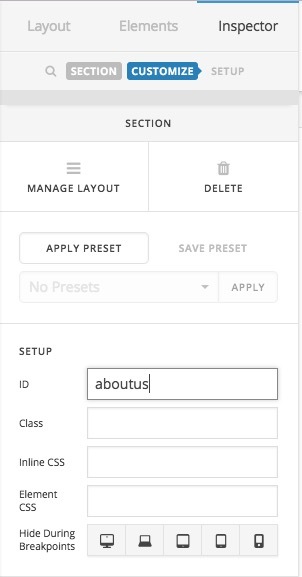 the settings you have selected in the Customizer), activating one-page navigation on any page will cause the menu to become Fixed Top for that page due to the special requirements of this functionality. For example, if you happen to have Static Top, Fixed Left, or Fixed Right selected in the Customizer, activating a one-page navigation on any page will make only that page's navigation behavior switch to Fixed Top. This is necessary for the one-page navigation to function correctly and should be considered when setting up your site and when wanting to use the one-page navigation feature. What is the best way to add Menu items to elements in a webpage? Could be this achieved using x theme? How to achieve this effect in pro menu? Can I create a front page like "https://theme.co/x/" with "x"? How do I create a menu for a single page site?